Some films stand the test of time, regardless how long ago they were made. If we take the examples of both war films and action movies, then Platoon and Apocalypse Now are both still as watchable as they were when they were first made. The same can be said for Die Hard, a film still regarded as one of the best action films ever. I think your appreciation of a film will also depend on when you see it too. A lot of people see these action films when they are first released and they become the benchmark that others are judged against. Although the more recent films are better, the original, older action films are still regarded quite highly. I was expecting some really good things from such an iconic action hero character. With that in mind, it was a shame that I saw First Blood for the first time in 2012. My experiences with Rambo before this year hadn’t been great anyway. I’d always thought of him as an iconic action hero. I assumed he was star of a great action franchise that rivalled Die Hard, especially considering how iconic Rambo is as a character and how popular he had become. 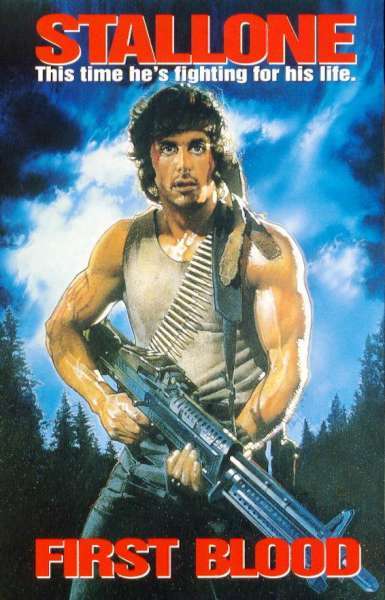 I watched John Rambo, the most recent movie in the series, a couple of years ago. Having no real knowledge of Rambo, I wasn’t impressed. It was an extended battle scene, with no real point or purpose. It seemed that the only thing going for it was the fact that you could see Stallone become one of his most famous characters again and that it was ultra violent. In a time when action films are becoming bigger and better, this didn’t feel like enough. Unfortunately, First Blood doesn’t seemed to have aged that well. So I watched First Blood hoping to see some action film gold, an initial movie that warranted a whole franchise and the popularity that went with it. What I saw instead was a film that hasn’t aged well considering the other films that are on offer now. The film is essentially a movie about one-man versus a local police force. He has combat training from Vietnam so he can use the guerilla tactics to take the advantage. That means we are watching him set traps, shoot a whole load of people and stalk through the forest, taking apart the local police force. That’s about it. No tension or real threat to Rambo. We are just watching our hero succeed for 90 minutes. There needed to be more to the film than just a guy killing loads of people. That simplifies it a little bit because there is some attempt to make the film a bit deeper. The opening of the film, where the police force takes a disliking to Rambo and torture him into submission and eventually snapping, is done really well. It hints at a man who has suffered from post traumatic stress, caused by the horrors of Vietnam. There is even an attempt later to bring in an old General of Rambo’s, adding more depth to his history and why he is doing what he doing. This becomes silly though when the film’s finale is Rambo breaking down, shouting incoherently about his treatment during the Vietnam war. It’s as if Stallone bolted on a message to what is essentially a generic action film. The best part of the film is when Rambo is being “tortured” at the beginning. All I kept thinking while watching Rambo was that there is better action or war films out there that make First Blood look very average. It’s another case of expectations being far too high so that when actually watch a film I think is going to be a classic, it hugely disappoints. I just wonder if other people, seeing First Blood for the first time now, would think the same, rather than remembering it retrospectively as a film that they believe is much better than it really is. 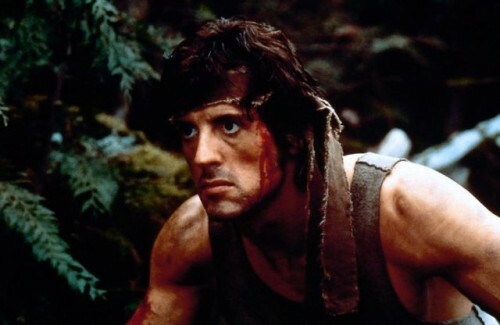 Overall, First Blood does not warrant the reputation it has as a great action film. The action is decent enough but its nothing we haven’t seen loads of times before, combined with much better stories. Maybe its the fact that I have seen too many films since First Blood was made, that it skews my view slightly. If you compare it to Die Hard, which is probably its closest cousin, it pales in comparison. So far, Rambo is a huge disappointment.